Dashlane 6 is out with new features, and the next time you pay for your premium subscription, it will cost a whole lot more than. Is the extra cost worth it? 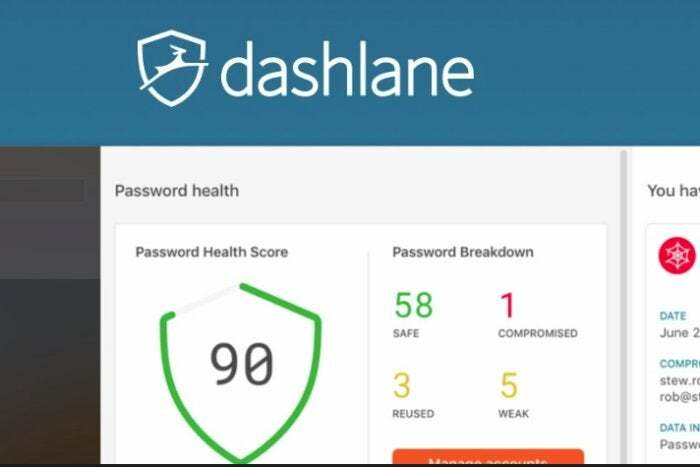 Dashlane, the popular password manager, just updated to Dashlane 6, bringing a whole raft of new and improved features, including a Dashlane VPN. With those new features, however, comes an impending and significant price hike. The next time your Dashlane Premium subscription comes up for renewal, the cost jumps from $40 per year to $60–a 50 percent increase. There’s also a new Premium Plus subscription for $10 per month with some extra credit monitoring features. Whether you pay $60 or $120 per year, that’s a lot of extra dough to fork over when your subscription comes up, which begs the question: Should you pay the extra cash for all those new features or jump ship and try something else? 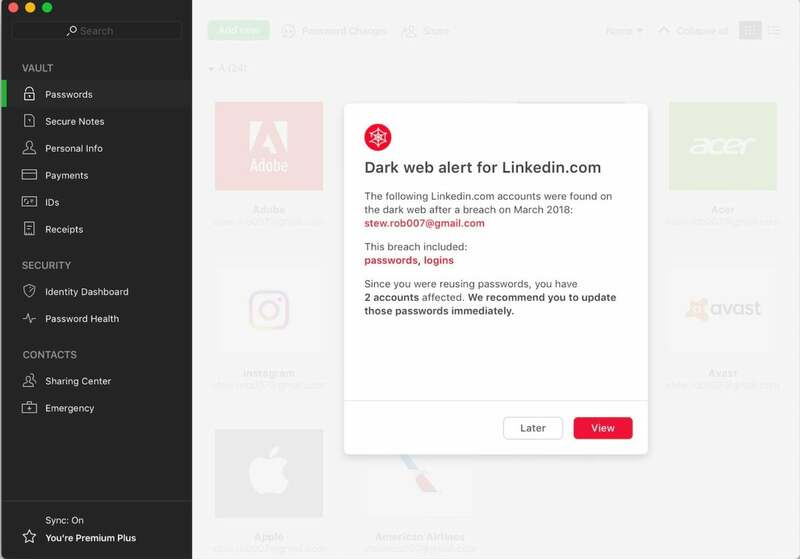 A Dark Web alert in Dashlane 6. Top of the list for the new Dashlane Prmeium is a virtual private network—note that you don’t get this in the free Dashlane version. A VPN creates a secure tunnel between you and the Internet. First, your device connects to Dashlane’s servers, and from there Dashlane routes your traffic to the websites you want to visit. That all happens in the background once you’re connected, and as far as you’re concerned, you use your device as you normally would. A VPN is a key part of identity protection for those times you’re on public Wi-Fi networks at a coffee shop, airport, library, or wherever. VPNs can help prevent man-in-the-middle (MITM) attacks where a hacker sitting on the same Wi-Fi network as you attempts to disrupt your web traffic in order to steal data, such as usernames and passwords.Tip: Even with a VPN enabled, we still recommend you don’t visit banking sites or other financial services on a public Wi-Fi network. 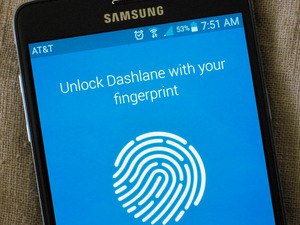 Dashlane’s VPN–with infrastructure supplied by Anchor Free’s HotSpot Shield–is very basic. You don’t get to choose your server like you would with a regular commercial VPN. Instead, it just connects you to the closest possible server to your location. That makes sense since Dashlane is focused on securing your Wi-Fi, and not getting around regional restrictions for Netflix and other sites. At any rate, we’ll note there are no limits on VPN bandwidth or connected devices. The Identity Dashboard in Dashlane 6. 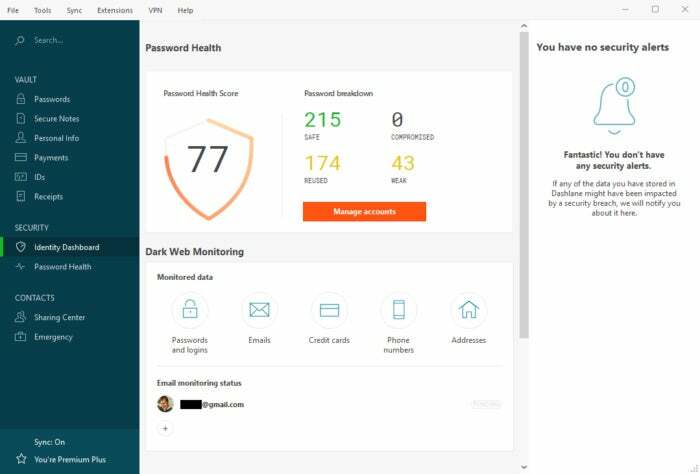 Dashlane’s swapped the Security Dashboard in earlier versions of the program for a new Identity Dashboard. The new dashboard still summarizes the overall safety of your logins, including a password health score. 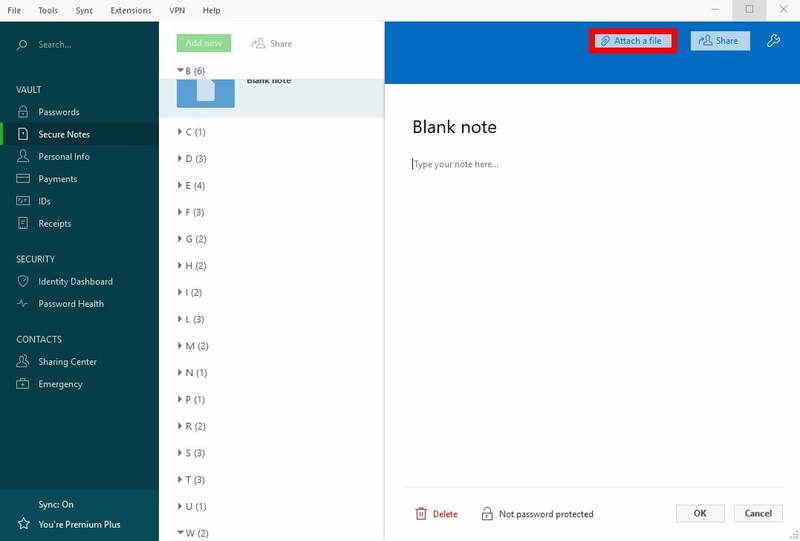 However, the deep dive into your specific problem areas is now under Password Health, which is just below Identity Dashboard in the left rail on Windows. Beyond passwords, the Identity Dashboard includes dark web monitoring for email addresses, usernames and passwords, credit card information, phone numbers and addresses. Once you ask for a scan you, will receive the results via email. The Identity Dashboard for Premium Plus subscribers also has a link to a TransUnion-run site with Dashlane branding where you can view your credit score, credit history, and get email alerts about your credit. This service is included in your subscription, but you do have to create a new account to get access. For what it’s worth, LastPass also offers credit alerts via TransUnion. You can attach files to notes in Dashlane 6. In what appears to be an extension of its secure notes feature, Dashlane gives you 1GB of secure file storage for sensitive documents. There isn’t a specific part of the Dashlane interface for this, but if you go to Secure Notes in the left rail, and then click Add New, you’ll see there’s now an option to attach a file. This is a fantastic addition and one that competitors including 1Password and LastPass already support. You can use this feature for encrypting crucial financial documents, contracts, a sensitive contacts list, or anything else you need to keep secure but available across devices. A new window will appear asking you to call a specific number for phone support and enter a passcode when prompted. There’s a separate number for making an insurance claim. 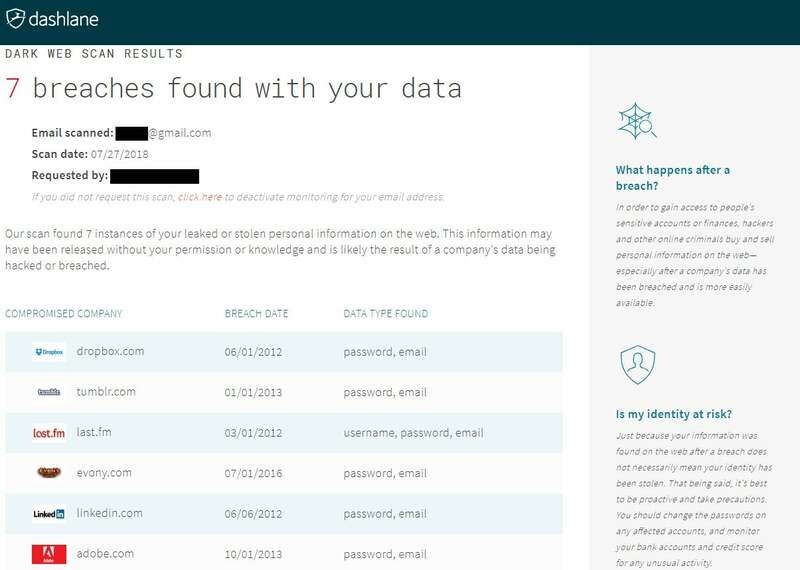 Dashlane Dark Web scan results. So those are the new features. Before going any further, I think we have to reassess what Dashlane is. With version 6, it’s no longer just a password manager. Instead, it’s a platform for protecting your digital identity (or indentities) from multiple angles: protection from open Wi-Fi network attacks with a VPN, identity theft monitoring and protection via the TransUnion partnership (Premium Plus only), the usual protection for your password database (and automated logins), and protection for sensitive files with 1GB of file storage. Some of these features, however, are also offered by competitors, including file storage, database breach alerts, and credit monitoring alerts. With the price hike coming, Dashlane is becoming the most expensive option among the popular password managers. It used to cost just $40 per year, but now that price is going up to $60, or $120 if you want to go all out with Premium Plus. The Premium plan’s $60 price is more than double what you’d pay for a $24 annual LastPass subscription, and it’s a hefty price hike over a single user 1Password account at $36 per year. Is the basic “set it and forget it,” zero server choice VPN worth it compared to the value you get from your current standalone service (if you have one)? Do you need constant access to your credit report via TransUnion (Premium Plus only) or will your annual free copy do? Are the other “concierge” type TransUnion identity theft services for Premium Plus subscribers something you’d like to have in place for piece of mind? Is the dark web monitoring of value to you, or are you fine with password breach alerts from competing services? If any of the newer features mentioned in these questions appeal to you then Dashlane’s higher-priced service may be the right choice. As for the 1GB of secure file storage, that’s a standard part of both LastPass and 1Password subscriptions. If document storage is the deciding factor then you can get better value elsewhere.